The Sparkle Crew was super excited to share the shine with festival-goers at By The C on a sunny Sunday in April. Toes in the sand, Bernard Fanning and Missy Higgins’ voices floating through the air, we spread the love (sparkles and bubbles) to as many as we could! We had an abundance of beautiful sparkling friends by the end of the night. ✨ Two wholesome best friends got matching glitter beard and chest hair sparkles in their favourite colours. We loved helping them express their brotherly love to the world! ✨ One tentative lady got peer-pressured into glitter by her sparkly friends and ended up loving it. She brought her husband back to get a rainbow glitter beard and later returned a third time for herself, sporting quite a glittery mouth. As always, Born To Sparkle brought a customised glitter tattoo just for By the C. Some chose to rep the (rather large!) By the C glitter tattoo on their faces in colours that popped a mile away. We managed to fill By the C with a hoard of shimmering mermaids, lazing around on the beach with their mermaid friends and family. Cottesloe beach was an amazing setting for this relaxed, family-friendly event. Everyone could swap out whatever was on their plate that week for some fish and chips, wine and great Aussie music. Bernard Fanning and Missy Higgins were joined by guitarist, songwriter and multi-instrumentalist, Kim Churchill. Also performing were funky Melbourne collective Saskwatch and rising stars, folk-pop duo, Olivia Hally & Pepita Emmerichs of Oh Pep!. One thing you can always count on is for Born to Sparkle to bring the fun. 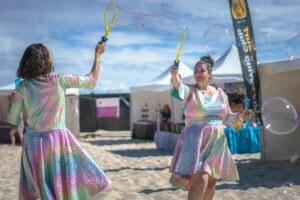 We were happy to provide a free bubble servicing to all attendees, which involved us running up and down the beach with our giant bubble wands. We’ll be bringing the fun to one lucky sparkler, Tegan Brown, who has won herself a FREE Sparkle Party! Tegan’s glittery By the C selfie attracted 86 votes in our monthly #sparkleandwin competition, making her our April winner. If you’d like to win a free Born to Sparkle Sparkle Party, all you have to do is post a picture of your sparkles on social media and hashtag #sparkleandwin to enter. Check out the latest touring artists at Zaccaria Concerts.